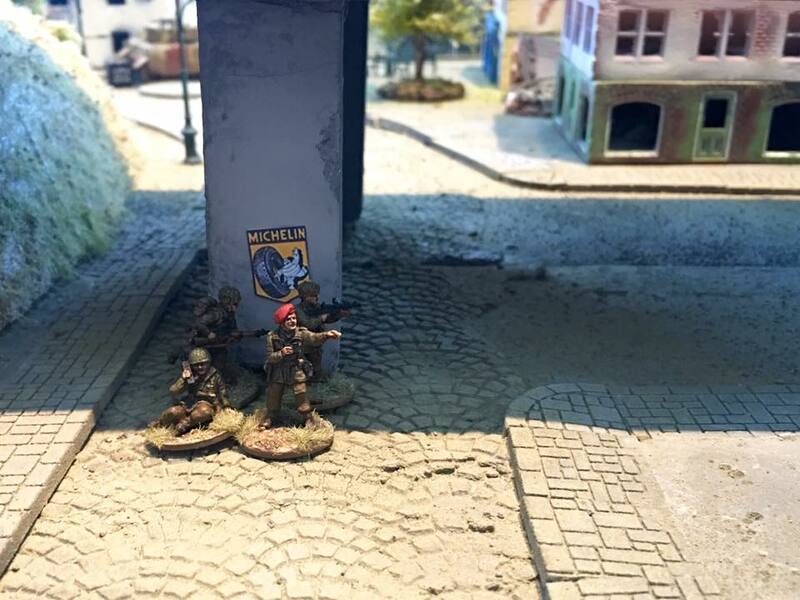 Back in March, during our Foy game, we got to talking ’bout some Arnhem. 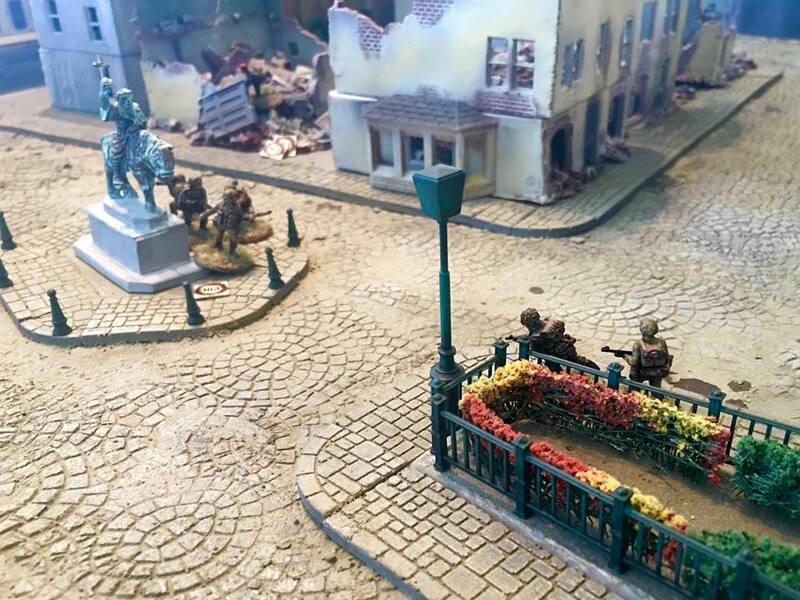 A quick lookup turned up that the anniversary of Market Garden actually lined up with our regular gaming slot in September, with the actual day being the anniversary of Operation Berlin (aka: the evacuation ending the endeavor). With six months lead-time, surely we could do a big Market Garden game by then, right? 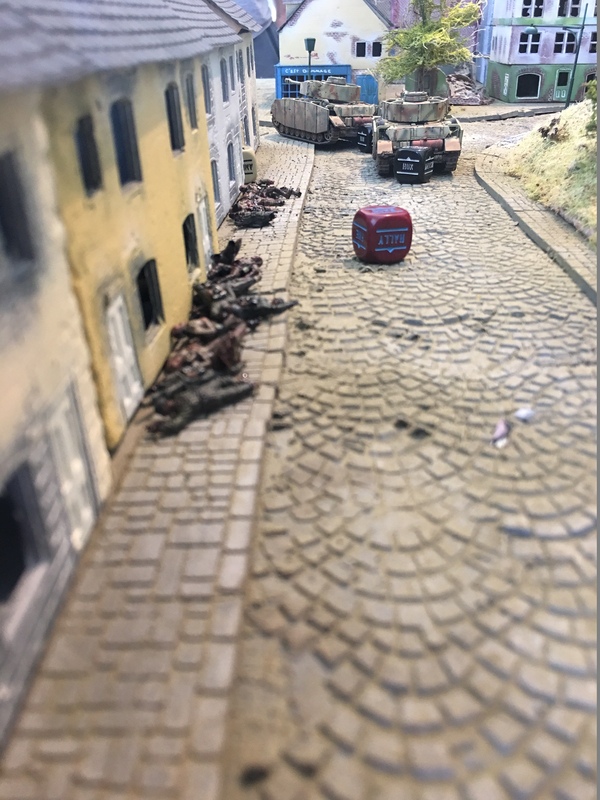 Fortunately, we very quickly scaled back our plans from a series of linked games covering the high points of the Operation from start to finish down to ‘simply’ doing Frost’s attempt to hold onto the bridge in Arnhem. This was the right call. Steve, who knows a lot more about this than I do (I’ve watched A Bridge Too Far, and have read the book on which it’s based, but that’s about it), did all the planning, John already had the Germans painted, and did all of the table, which is (as you’ll see) amazing. 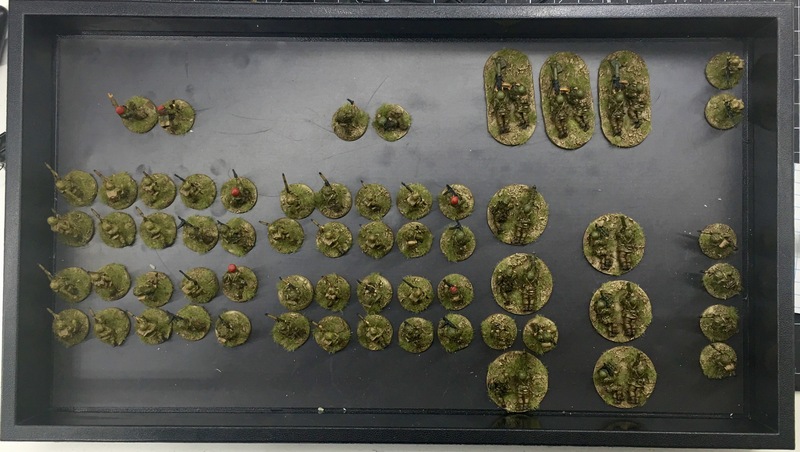 I painted up the British paras. 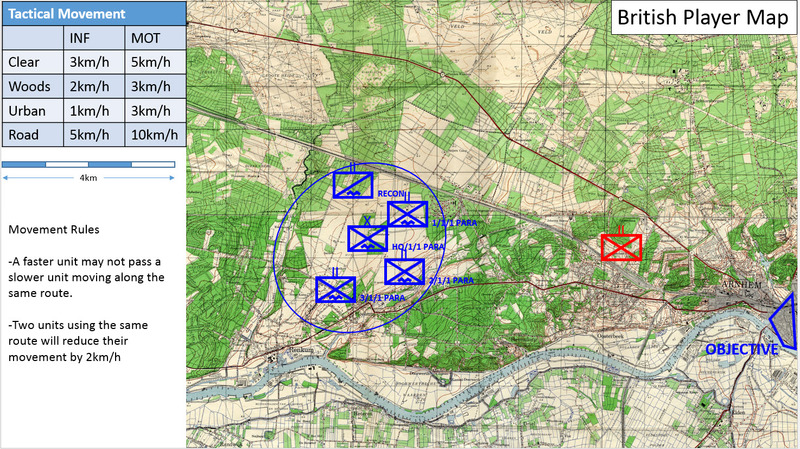 There was an online, pre-game component where the British and German teams determined how they would deploy and maneuver. 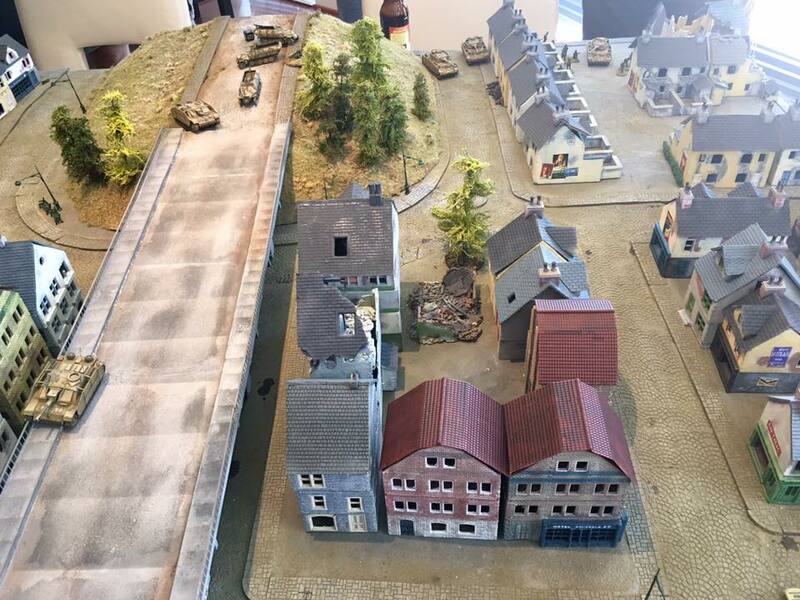 Although the Germans responded the same way they did historically, the British did things a little differently, which resulted in 1) Frost not even getting to the bridge and 2) the British that did needing to defend it from the town and across the river. I ended up on the German team. 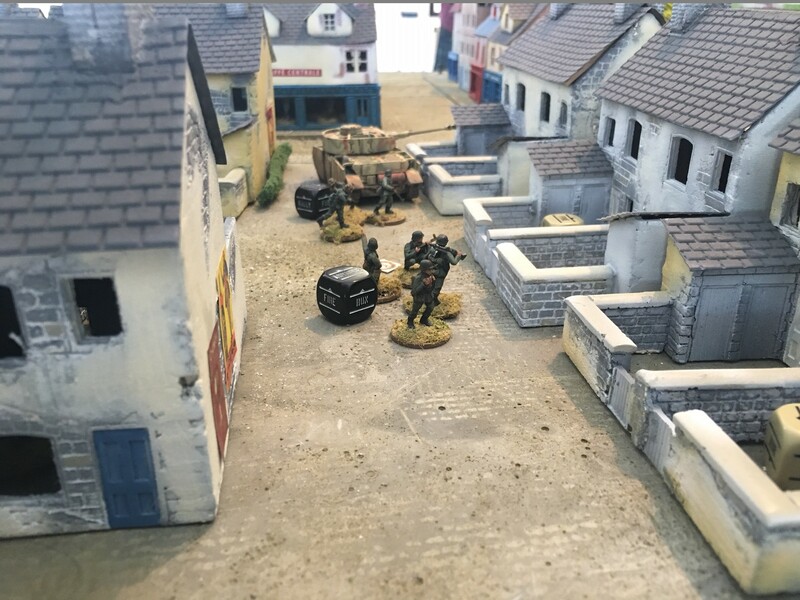 Because we assumed they would concentrate their forces on the buildings overlooking the bridge, the plan was to advance through the buildings on the East side of the causeway, ensuring they were clear and approaching under cover. That didn’t last long. It turned out the British were riddled throughout the those houses. Assaulting in Bolt Action 1E is decisive, and my rolling wasn’t so hot, so I lost 2 out of 3 assaults, which wiped out my infantry units pretty much by the very beginning, leaving me with a tank and not much else. That’s the silver lining of playing Germans in WWII: when you’re winning, you’re winning. 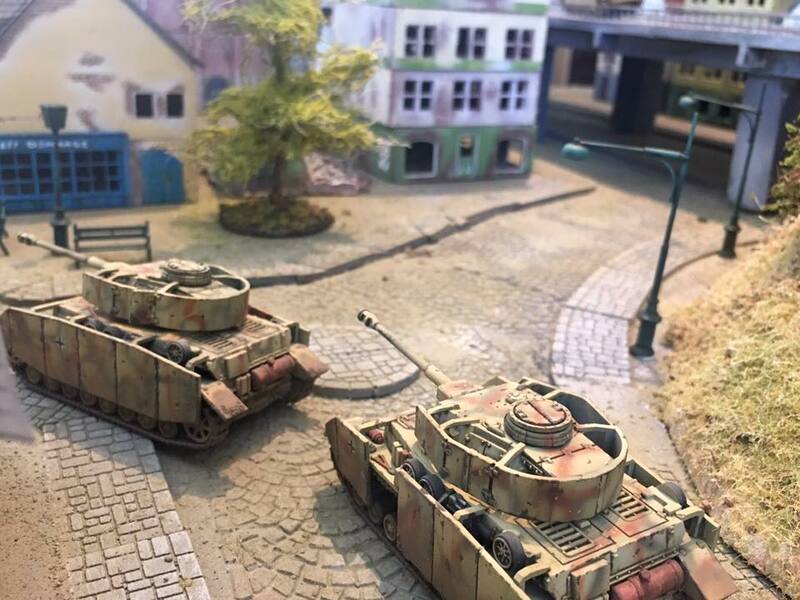 When you’re losing, the Germans are losing, and that means all is right with the world. We had a tough time pushing up that flank: both because the BA building rules, which are normally Good Enough, are especially punishing when there’s basically nothing but buildings. Needing to go room-to-room is entirely on point here, but I think we need to tweak things a bit somewhere here. We eventually got near enough to the buildings around the bridge, which meant the PIATs opened up. 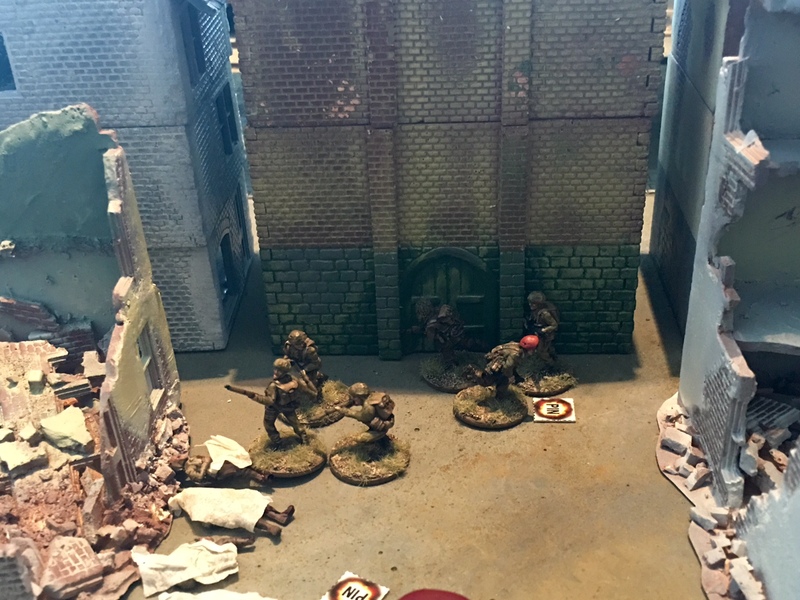 I did have one, brief, shining moment of usefulness when a PIAT from the top floor of one of the buildings fired on a tank: my tank returned fire and handily returned fire, killing everyone in the top floor. 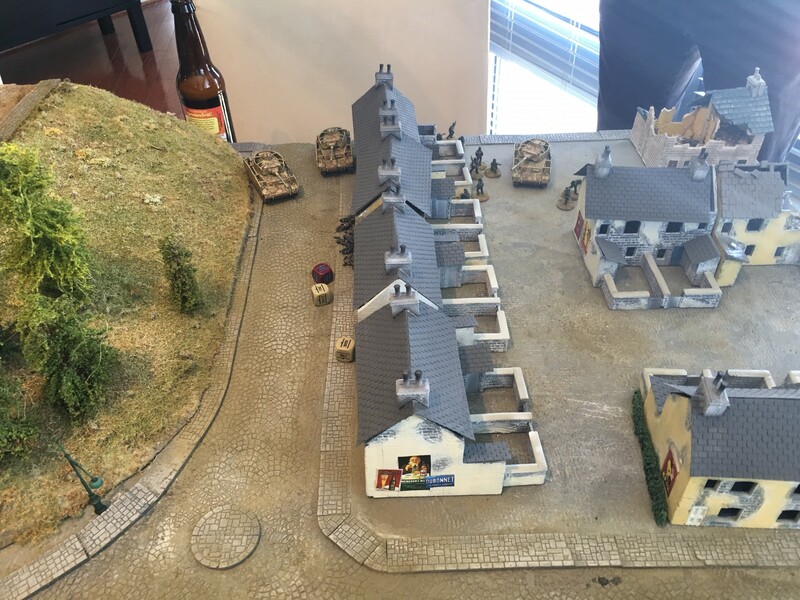 At the end of the game, though, the German progress was too slow: of the six buildings around the bridge, the Germans had taken/cleared two of them, and the British still occupied four. All pretty much agreed that the British had won the game. 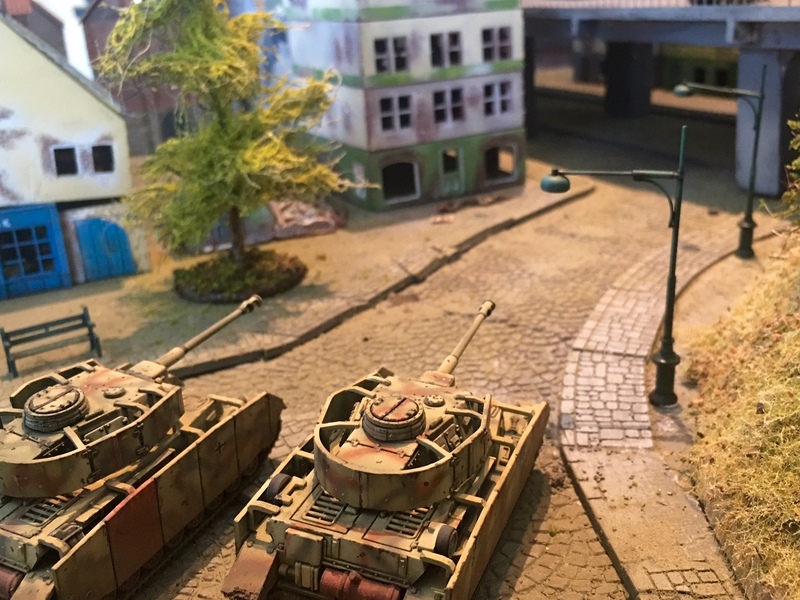 This entry was posted in Warpstone Pile and tagged Bolt Action, TGS on 2016-09-26 by Rushputin. Played another game of Frostgrave last week with Casey. Third in the series. 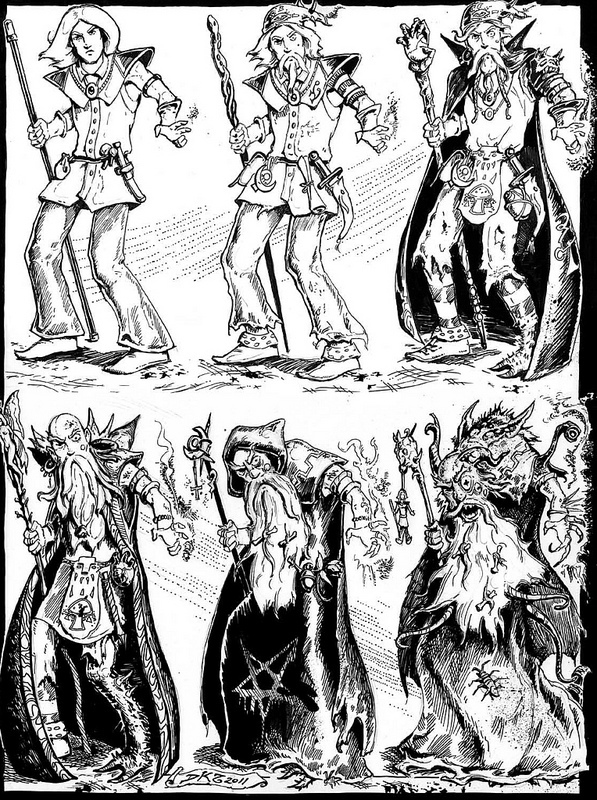 The campaign is nominally “Thaw of the Lich Lord” (literally: that’s what I’ve been putting on my warband sheet), but we’ve mostly been goofing around with it. 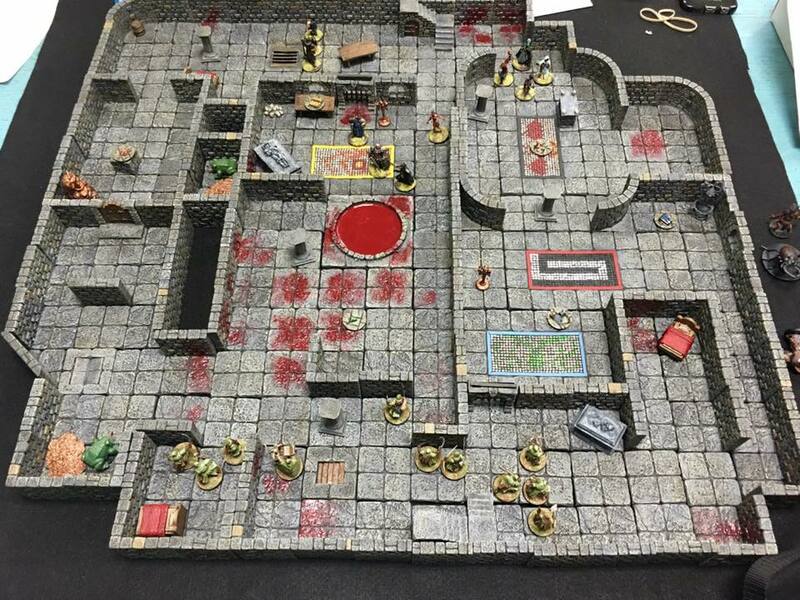 Game 1 was Thaw’s “Total Eclipse”, Game 2 was “The Mausoleum”, and this one (Game 3) was “The Well of Dreams and Sorrows” except, obviously, we used the Dungeon Set-up. Because things blend in a bit: yellow stars are treasure, green stars are special roll-on-the-Lich Lord table treasure tokens, blue stars are dungeon entrances (we didn’t have enough ways in, so the stairs down are warband entrances and Wandering Monsters can pop up out of floor hatches or, if undead, out of sarcophagi. We also parked Giant Frogs on top of the special treasures because that 16+ for Random Encounters doesn’t produce enough mayhem for my tastes. The pool of blood in the center is, obviously, the Well. I neglected to take photos turn-by-turn (maybe we’ll make a point of doing so next time? ), but you can kind of see the direction the game goes in: both of us break some guys off to each side and push down the middle with our Wizards. Wizard vs. Wizard, Apprentice vs. Apprentice. On the left, my Treasure Hunter chumped the Giant Frog, leaving the special treasure for the Thief to collect. 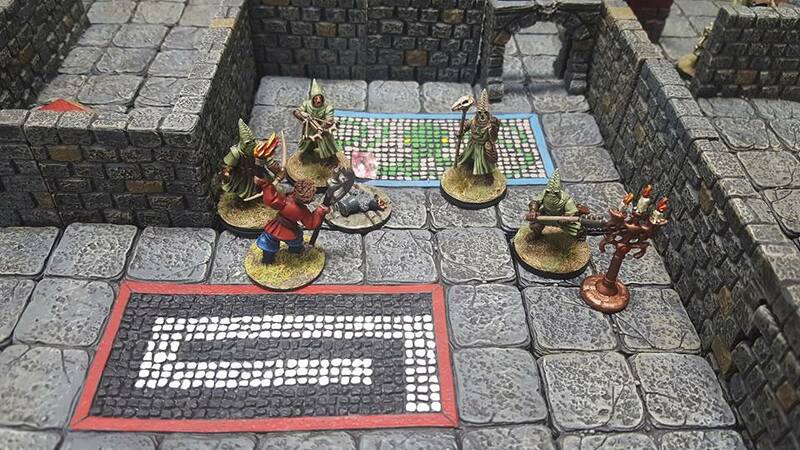 He sent two models into the secret room to fight the Giant Frog on his side, which was a Mistake. They were obliterated by the Giant Frog immediately. What was going to be an Apprentice-on-Apprentice showdown ended early when his Apprentice caught a Crossbow Bolt to the face. Things are going my way, right? Not as much in the middle. 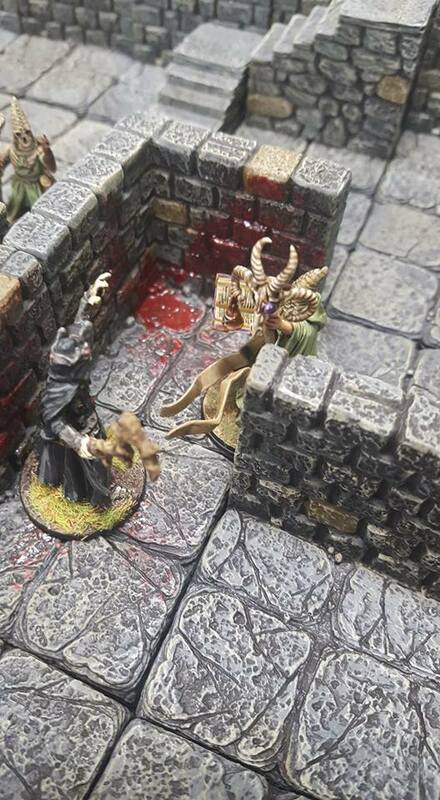 A bit of back-and forth, a few henchmen cutdown, and a clever gambit on my part that fell apart after reading all of the Leap spell text, and before we knew it the game boiled down to both of our Wizards, standing a few feet from each other, on their last legs, flinging Bone Dart at each other. standing in a mall food court gibbering, spitting, and flinging chopsticks at each other for an extended period of time. People stand by, uncomfortable and unsure how to respond. It goes on and on. Suddenly, a chopstick embeds itself in one of the combatants eyes. He screams, and blood sprays across across the bystanders as he dies messily. Seriously, round after round of “I’m at 1 wound. I probably should run away, but he just missed Bone Darting me, and he’s only at 1 wound, too, and if I can Bone Dart him I’ve got this! Okay. Bone Dart it is!” Ending, of course, with my Wizard getting eyeball chopstick’d and dying messily. We’re using the Just Play rules, that are explicit about between game order of operations: roll for Treasure, then roll for injuries. I got out with one of the Lich Lord treasures. Rolled: Crystal Rose (lets you reroll on an Injury table). Rolled for my dead henchpeople, then the Wizard: rolled a 2. DEAD. A dead hireling isn’t a big deal, but a dead Wizard is HUGE. But wait: Crystal Rose! Re rolled the 2, and got a Close Call! My wizard lost all of his gear (Magic Spectacles and a Staff of Power (3)), but lived on! This entry was posted in Warpstone Pile and tagged Frostgrave on 2016-09-20 by Rushputin. It is accomplished. 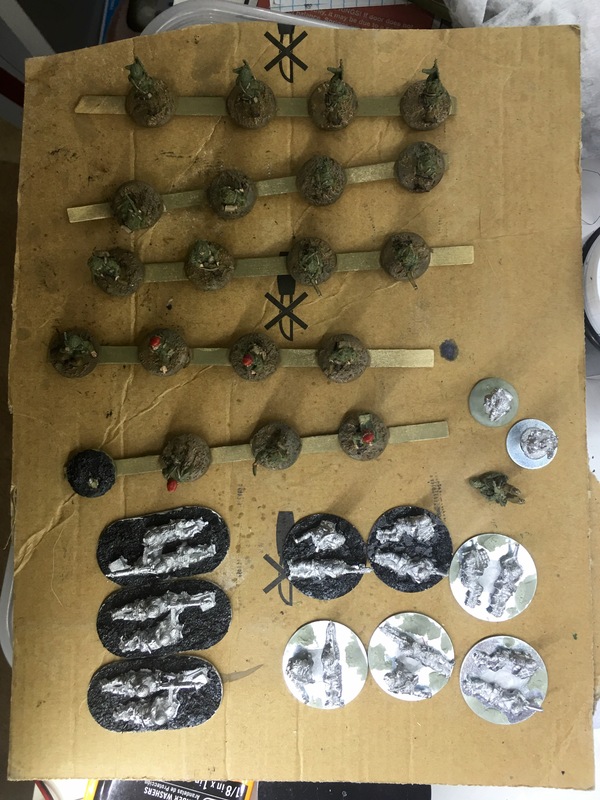 I’ve finished my (minor) contribution to this weekend’s Arnhem game. This is a hair more than we’ll actually be using, I think, but it’s a substantial step down from the original plan. I’ve got another 5 squads’ worth of minis prepped for painting, but I’m glad this is all I needed to do in the end. Having painted a bunch of these, I’ve decided that I hate this scale. 1/72 combines the drawbacks of 15mm (poor/difficult to paint detail, requires volume) and 28mm (sufficient detail to require attention) with none of their respective benefits (seriously who cares about detail, they’re 15mms and interesting detail enough to merit the effort), hitting a sour spot between hassle and payoff. That’s why I won’t be sticking these bastards into the lightbox. I’m sure I’ll finish off the rest of them at some point. It’s a shame that they’re Paras, and so likely don’t need much in the way of vehicles, which I gather is the point of the scale. The table, however, is going to be magnificent. 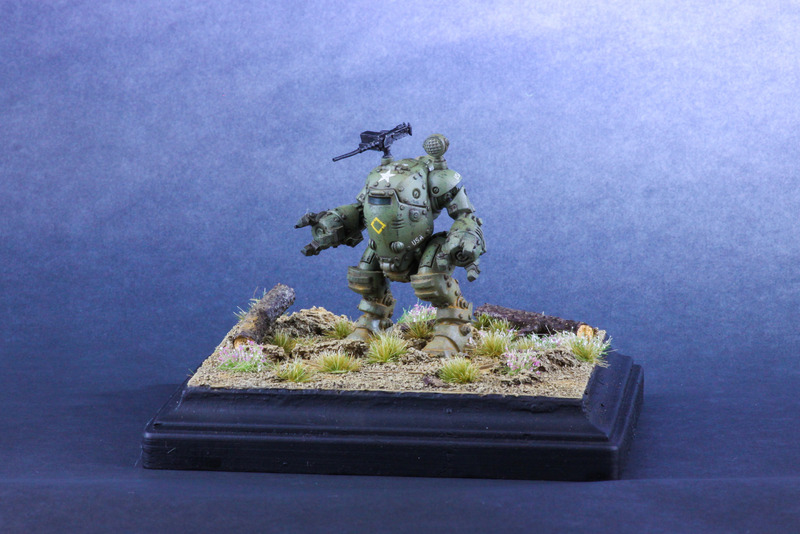 This entry was posted in Warpstone Pile and tagged 1/72, Bolt Action, hobby on 2016-09-19 by Rushputin. 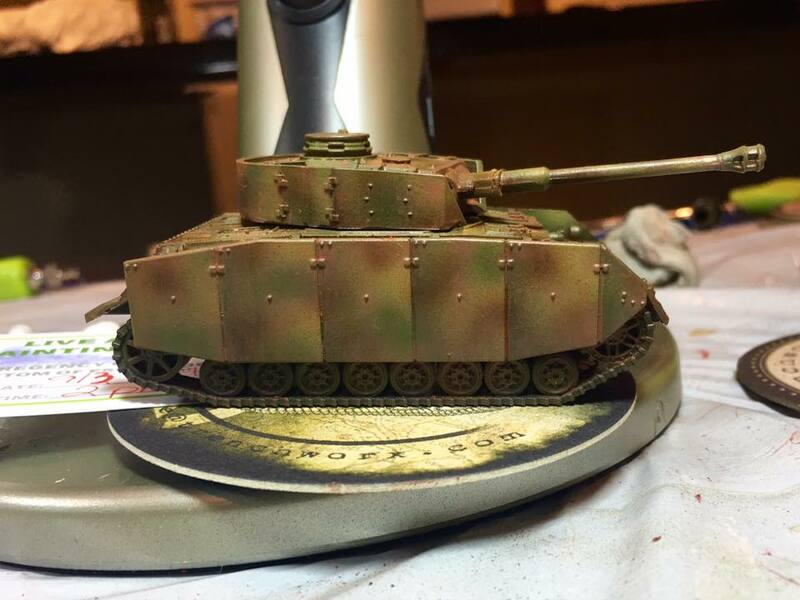 I’m grinding away at these damn 1/72 Red Devils for later this month. 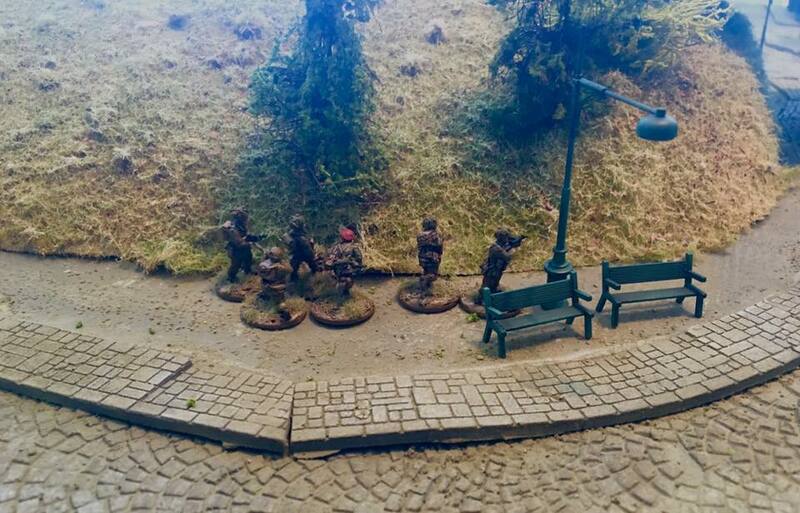 I have to admit: the Eureka AB models are definitely better than the Plastic Soldier Company… but they’re still awful. Juuust about done with the 20 up top, then it’s weapon teams and (I need to double check my numbers) probably a couple of riflemen to round out a squad. Then on to Deadzone terrain! This entry was posted in Warpstone Pile on 2016-09-14 by Rushputin. Those new Hadross Pit Fighters are rad, right? They’re top-heavy as heck, and those tiny feet & skinny ankles are going to be a beast to pin. This entry was posted in Warpstone Pile on 2016-09-07 by Rushputin. Despite having what felt like the most harried build-up to the convention yet, this was probably the lowest-key NOVA I’ve had. My schedule was pretty light, and I didn’t stay at the hotel, so most of the convention ran only about 8 hours a day for me. In some ways, this was good: I didn’t really push myself hard, didn’t do much in the way of scrambling from one thing to another. In other ways, less so: there was a lot more to do that I simply didn’t. 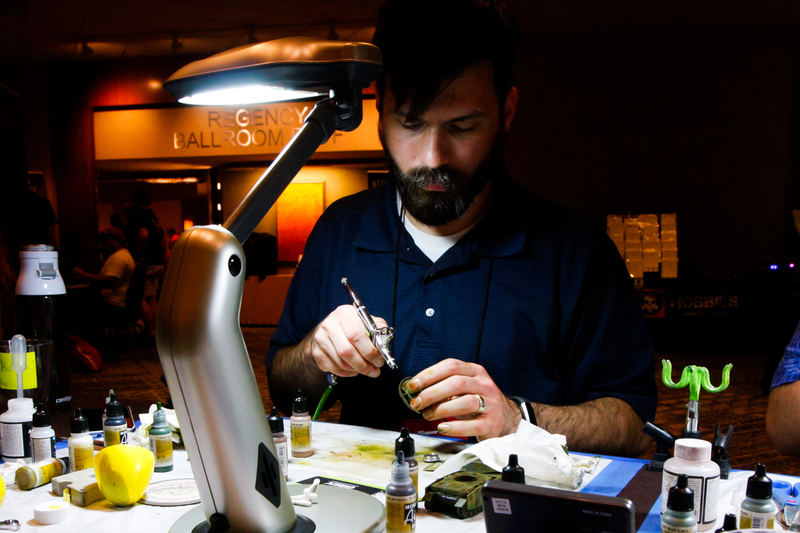 Initial registration was for nothing but Capital Palette and Jessica Rich seminars. I didn’t know what game to commit to, and although I gotten a lot out from the other instructors in the past I hadn’t met or had the chance to take any classes with Rich before. Then, just about a month ago, I decided to throw in on the Wrath of Kings event(s). Capital Palette looked like it was going to be a waste: between my heartburn over the change in format and my lack of hobby time leading into the convention (still adjusting to the new job’s schedule and what hobby time I’ve had I spent painting Wrath of Kings), I simply had nothing to enter a week before the event. In the end, I ended up with 3 CP entries, 3 seminars, 1 speedpainting entry, and 1.5 tournaments. Up front: I did have heartburn about the new format, but I think I was probably wrong, which is good. I don’t know what’ll happen to the format next year, but at least 2016 wasn’t the problem I feared it would be. How bad was I about taking pictures this year? So bad that I don’t even have pictures of my own stuff in-cabinet to post here. The weekend before NOVA started on my entries. I didn’t expect them to go anywhere, but figured I’d paid for the pass and more models in the case is better for the event. I ended up entering a Trenchworx A7V (previously documented here) and the Konflict ’47 M5A9 Coyote Walker as well as, after some consideration, a selection of my Frostgrave Cultists as really the only new minis I’ve painted over the past year that I think hold up well. In the end, I made final cut with the Cultists and got a Bronze with the A7V. This exceeded any reasonable expectation, I think. This isn’t false humility or self-deprecation: this is, I think/hope, a realistic assessment of the level of my skill, my work, as well as that of the other folks who compete in these things…. and my game was pretty weak this year. Anyway, despite some work into tarting up the display block, the Coyote, frankly, was unfinished. That the Cultists made cut but no more is on point: I do think they’re good models, but hey: they’re gaming minis and I painted 7 of them in a weekend. 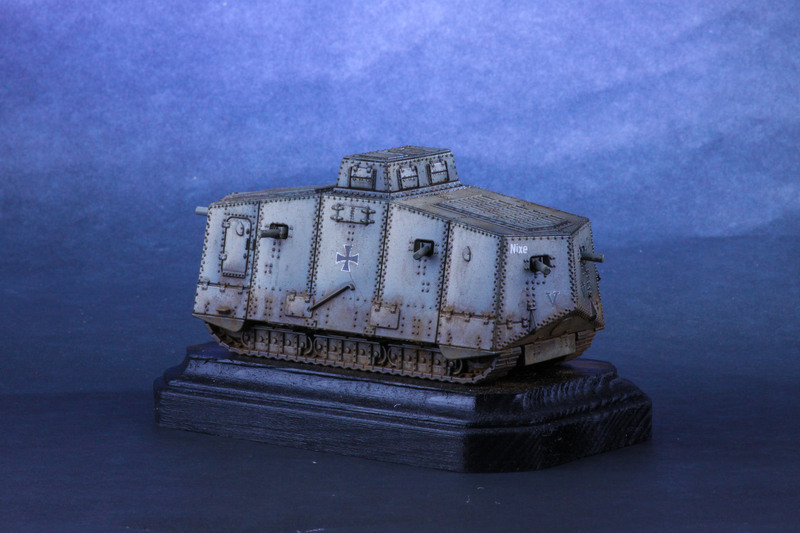 I think there’s a lot of cool stuff going on with the A7V, but it, too, feels less than fully complete to me so that it got a medal is a huge, pleasing surprise. Unfortunately, the CP photographer doesn’t know what an A7V looks like, and so photographed it backwards. The best thing about the new format: they did a separate awards ceremony before the closing ceremony. Everyone got to see every entry that won a medal and got to put faces to names. Keep this up for sure. I’d considered doing it, then decided against it. Then, while shooting the breeze, John convinced me to sign up for it after all. I’m really glad I did: I had a great time with it: it was a lot of fun, I’m proud of my entry, and I liked it enough to consider doing it again at 7:30 Sunday morning to take advantage of my lessons learned. (I didn’t, but maybe I should have: those 7:30 entries swept, I think). Given where I was with an airbrush this time last year, this is amazing. Heck, given where I was with an airbrush this time last year, that I freaking medalled with an airbrushed vehicle is freaking amazing. Anyway, I will definitely be doing it again next year. As previously mentioned: I did it. I got a WoK skirmish list painted up in time for the con. The format calls for two sideboards: I only had the one, but it was enough. Now that I’ve gotten some more, focused games in, my opinion of the game hasn’t changed: it’s got some depth/complexity but not too much depth/complexity. 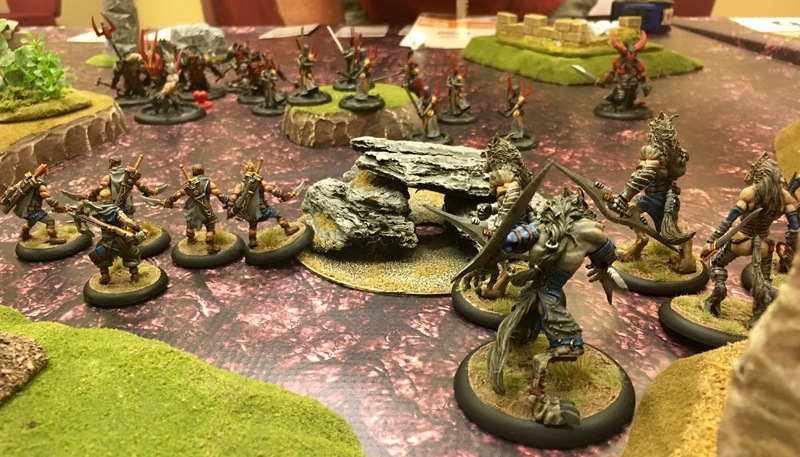 There’s not enough there for a primary game to play week after week, but it’s definitely worth having around to break out every now and again. 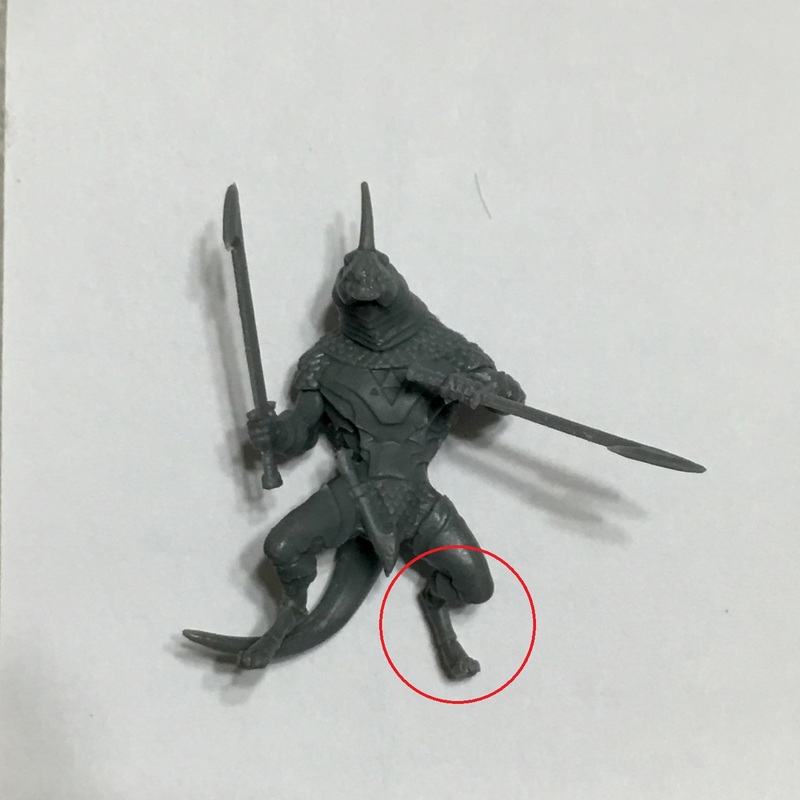 CMON has been relentlessly aggressive in getting a starter into the hands of pretty much every man, woman, and child in America at this point, so there’s no reason not to put the models together, paint them up, and push them around. The Friday tournament was small: 6 people, but tight enough to be a good time. I ended up going 1/1/1, with two good games and one okay-but-I-think-we-were-both-tired game. It was light enough that I decided to pass on the Battle tournament, thinking that if Skirmish only got 6 players, Battle (with a larger model count) would get fewer. I was right: only 3 turned up (though 2 of them hadn’t played on Friday). I did end up playing in the Sunday tournament, but that was a mistake. It appeared to have a different format: “WoK: Skirmish Level Tournament” vs, “WoK: Skirmish Battle Royale“, there was a smaller window (3 hours vs. 4 hours), but ended up as a regular matched play tournament (like Friday) and because we started late and were ending early (I had a hard-stop at 2) I only got a hair over one game in. A little disappointing, but at least it was inexpensive. The CMON booth and game room was humming pretty much all weekend. I expect they sold quite a bit, so hopefully it’ll have a bigger presence next year. The Conquest of Kings format time limits were probably invented in a vacuum. 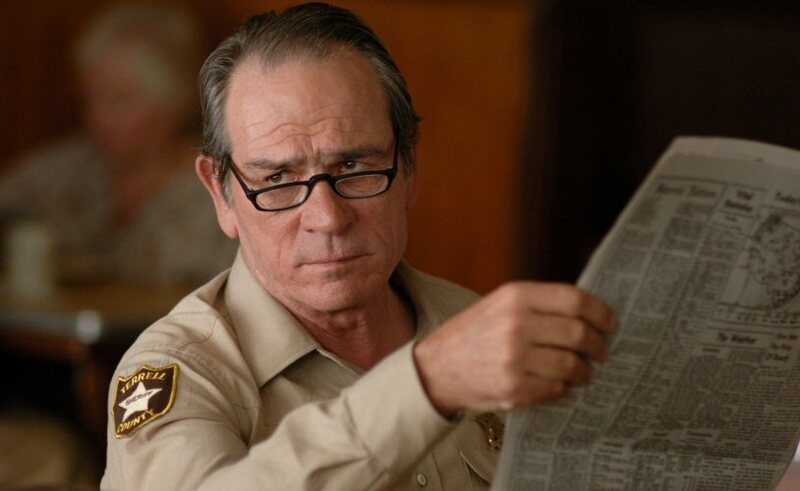 It’s plausible that the game’s designer is able to finish skirmish games in 1 hour or less, but for the rest of us… especially people who potentially just did a build-and-play the morning before. Of four games, I finished one in time. They need to pad that time out. The tables were not-great. Not bad, but not great. They were on par with the 40K tables, but I find those merely adequate and they have to have 800 of them. One of the lessons I think I’ve learned from HMGS & TGS is that beautiful tables have a greater impact than beautiful miniatures. Great example of this: Hobbit / LotR sure as heck feels like it’s a dead game to me, but it has the most beautiful tables at NOVA and so is humming with activity all weekend long. If CMON only has to schlep 8 4’x4′ tables out, I’d recommend considering punching them up. I missed them announce the winner. I stepped out to use the restroom and came back and there was a plaque on the table. When there are enough participants to count on less than two hands, I think it’d be worth making sure everyone’s there when you do that. I have to admit that I went into NOVA a little down on it. I had stuff that I was going to do, but not a lot, and it’s too expensive to just putter around. I had a great time, though, and I’m pumped and motivated and looking forward to next year. Next year I’m definitely doing Infinity. I’d had heartburn over the (lack of) painting requirements at Infinity events in 2015 & 2016 and, as with other my other heartburn, I don’t think it was born out. I cruised through the Infinity room a couple of times to see what people were running and although that’s hardly a scientifically sound polling mechanism, I think I saw one or two unpainted armies and that was it. The average quality of the models there was hundreds of times higher than could be said of the 40K room. Definitely in the cards for 2017. The big rumor mill was about Games Workshop and it’s involvement in NOVA. It was such a non-secret that I honestly hope nobody expected it to be. 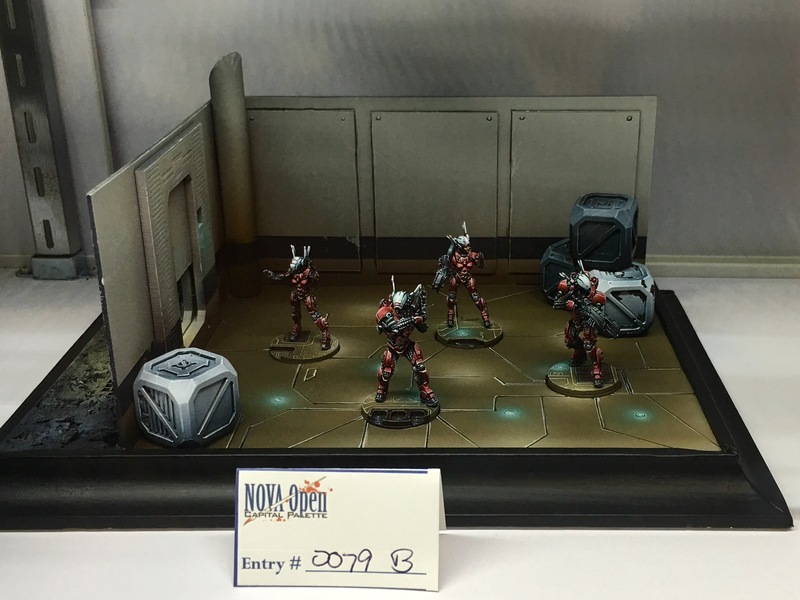 They provided a ton of prize support and are apparently going to be much more involved in NOVA 2017 0in some way or ways that have not yet been articulated. I’m cautiously optimistic. The only reason that’s ‘cautiously optimistic’ and not ‘fully glad to see’ is I do have some concerns about how it’ll impact the Capital Palette. One of the rumors was that this might herald a return of the Golden Daemon to the US. Although that would be great, the CP has had quite a large number of non-GW entries over the past several years. I wouldn’t be surprised if they were in the minority. 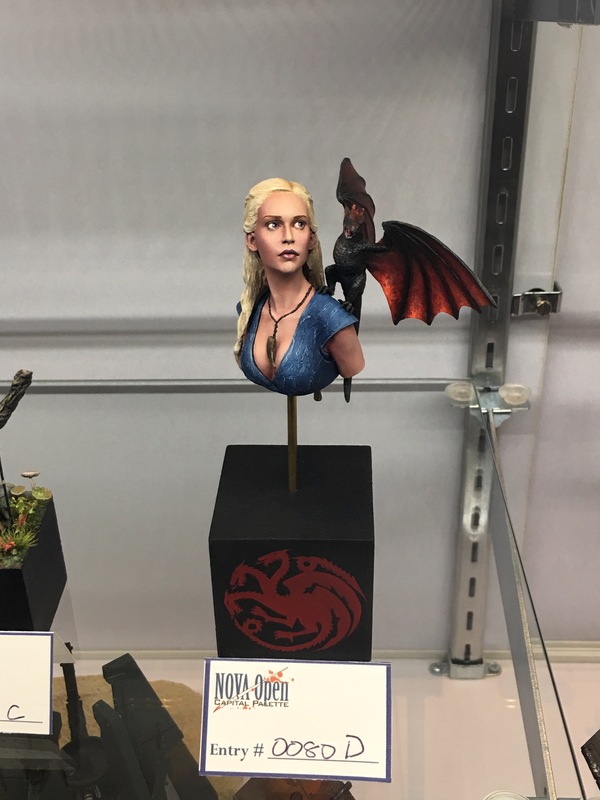 Any move that would exclude the sorts of models that have been getting submitted (especially now that there’s effectively a whole non-GW category: busts) would be a bad thing. If this happens, what I think needs to be the case is a parallel/sub contest. For example, Historicon has its categories: Sci Fi/Fantasy/Historical, etc… but there’s a whole two categories for Flames of War, and there’s a Warlord Best in Show award that’s done independent of the 10 categories people can submit to. 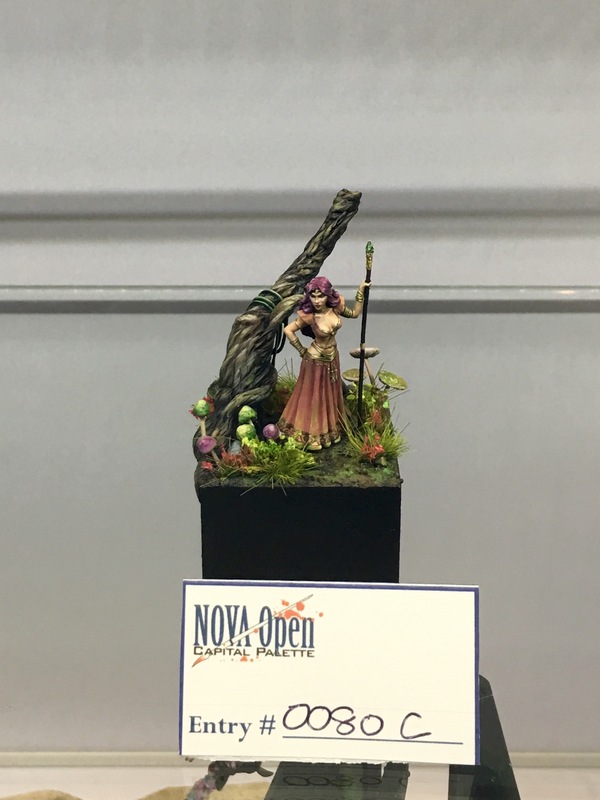 If you’re going to do a Golden Daemon at NOVA 2017: follow the Historicon model and either have separate, GW-specific categories or (better yet) simply have the GD awards selected from GW models entered into the existing categories. This was the best closing ceremony yet. For most events, they handled awards announcements and prizes within the context of the specific events: just as they did with the Capital Palette. This shaved down something that at one point took hours and hours and hours to something really lean that hummed along in great time. NOVA has solved the closing ceremony problem. Let the bells ring. This entry was posted in Warpstone Pile and tagged NOVA OPEN on 2016-09-06 by Rushputin.